We've got toys piling up in all corners of our shoebox of a row home because the Banana Berry is a very lucky gal and has a huge fan club. 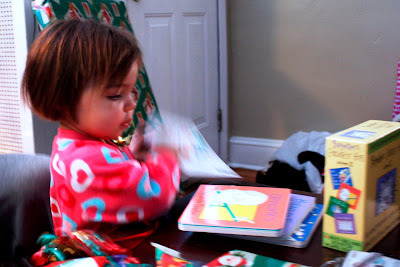 Brandy stopped by yesterday with presents: her favorite childhood books (Mr. Brown Can Moo! Can You? , Love You Forever , and Seven Little Rabbits ), all of which have these really cute name plates custom designed by Tim that say Banana's Book Fairy. 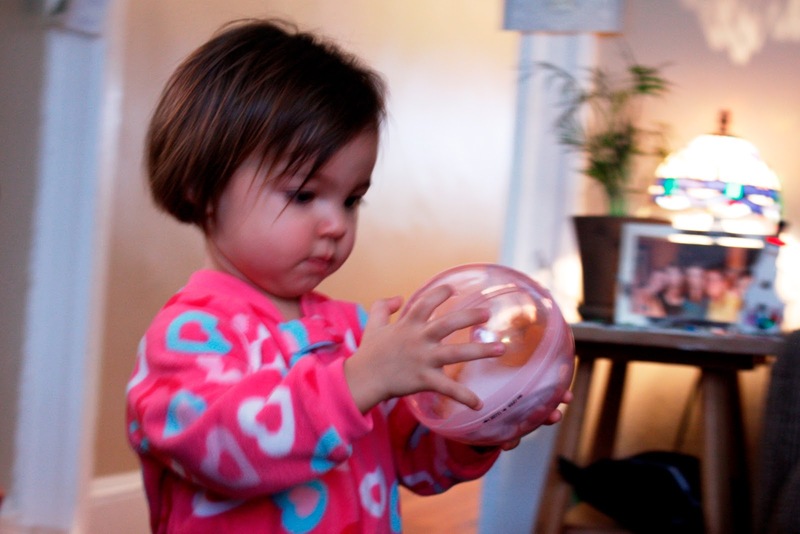 Uncle Joel got Hannah this weird little hamster in a ball thing (kind of like this one )...Here's Hannah inspecting this strange but fun little toy prior to dropping it to the floor where it rolled around for a few hours before we finally turned it off. Eric and I bought Hannah Boynton's Greatest Hits: Volume II , mostly just because I wanted But Not the Hippopotamus , my all time favorite Boynton book (Hippos Go Bezerk is a close second; as far as I'm concerned, it's all about the hippos). 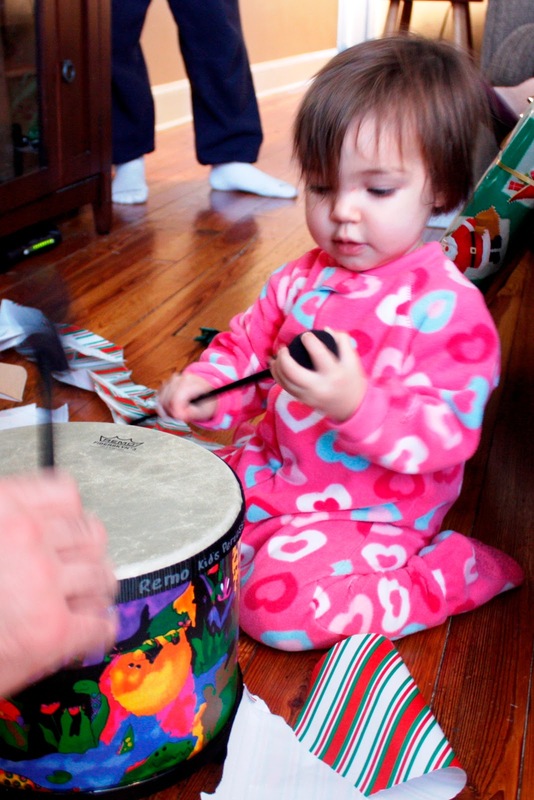 Grannah and Granpah got her this very cool drum . She knew exactly what to do with it and set about beating it immediately. I keep thinking that someday it'd be cool to get her a drum set. She's a pretty high energy personality so I feel like drums would be a good instrument for her. Every time I tell this to someone, they get this incredulous look on their face and exclaim, "Why???" That or they just say, "You don't want to do that." I don't get it. I think it'd be so cool! Eric and I also bought her the Hide and Seek Safari Jr. - Elephant (which she is unwrapping with Uncle Justin in the photo below), but we're unimpressed. The theory sounds cool: these stuffed animals come with a remote control that has one button. When you push that button, the animal makes its animal noise. 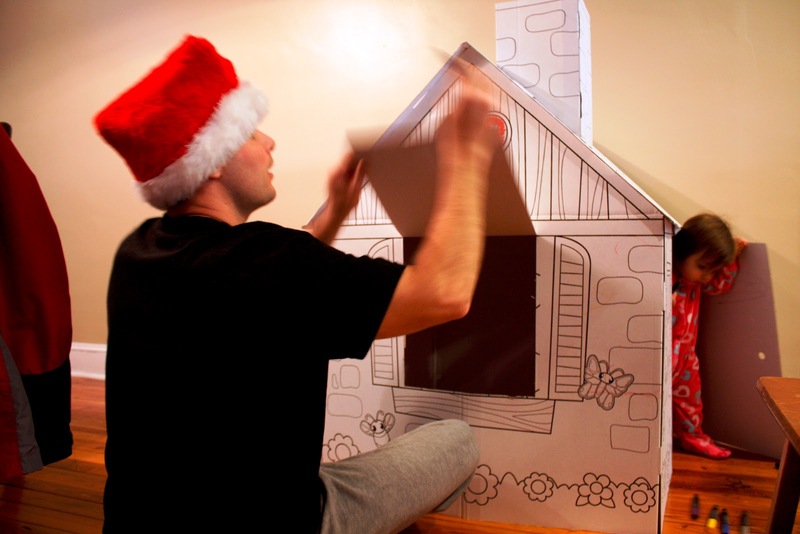 The point is to hide the animal and then use the remote to help the kid find it, kind of like Marco Polo for toddlers. The problem is that the remote doesn't make the elephant make its elephant noise unless you're holding it within about 2 inches from the elephant. We're hoping that it's a battery problem, but we've already changed them once and it didn't help. Remember that gaping mouth look she got when she opened her doll house last week? 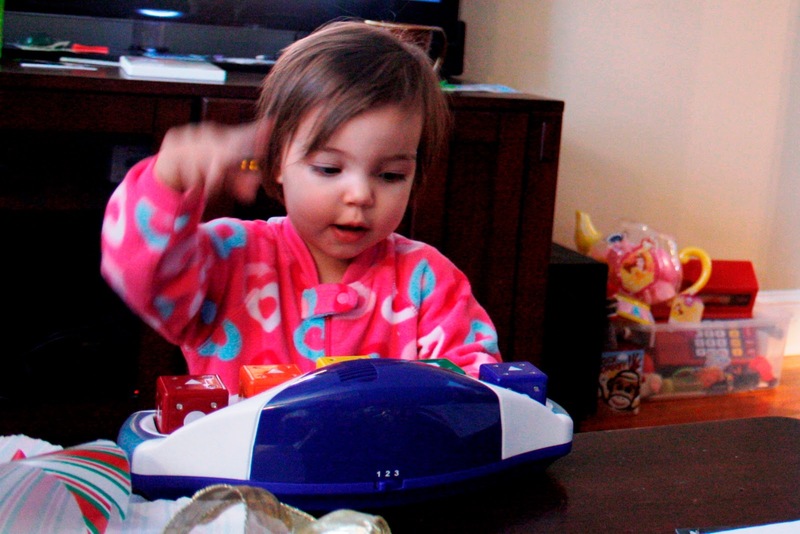 Well, she got it again after opening the Music Blocks that Grannah and Granpah bought her and I happened to catch it. I love this toy. There's five blocks, and each side of the block has a different shape on it and plays a different part of a song. If you put all the stars facing up in the right order, you can play a little portion of a classical song. If you mix it up and have a triangle, a square, a star, etc. it'll play a bunch of different pieces of different songs emphasizing different instruments, so you can sort of compose your own song. 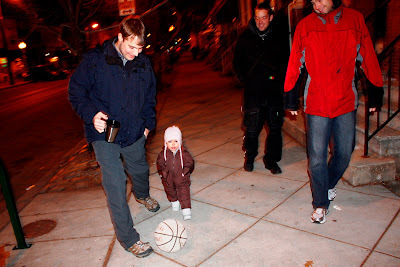 The boys I babysat had it, and we loved playing with it. Hannah has a hard time putting the blocks into their holes exactly, but she's catching on. 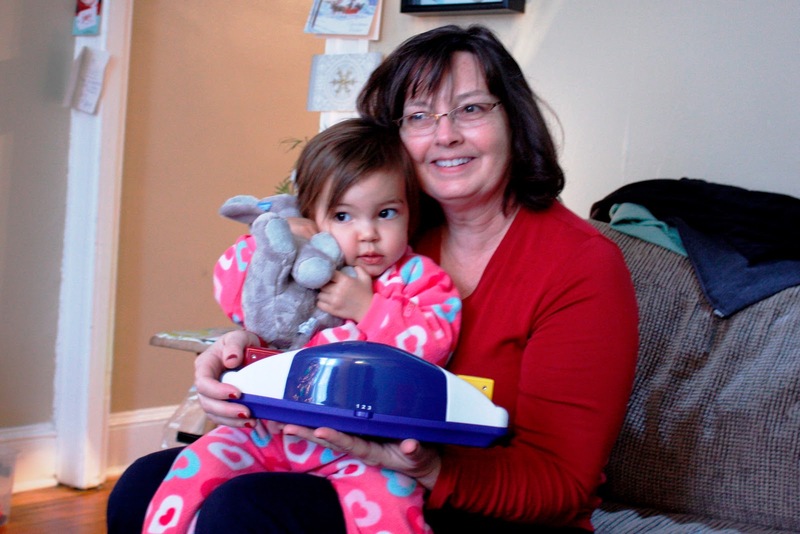 She took a break from the blocks to snuggle with Grannah and her hide and seek elephant. 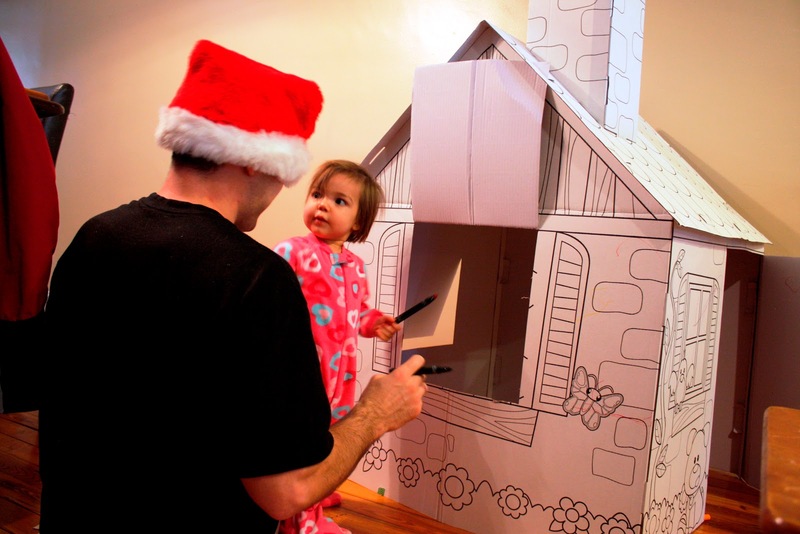 Uncle Justin got her a cardboard coloring play house that's kind of like this one , except not quite. We found this one at Michael's for only $12. Daddy has been helping her color all day. 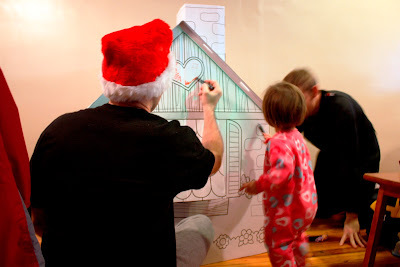 In fact, after she went to bed, Daddy and Granpah did a lot more coloring together--I repeat, Hannah was in bed asleep while Daddy and Granpah spent at least an hour of grown-up time coloring Hannah's house for her and even using the box cutter to make some minor improvements. This is devotion. I didn't get any pictures of that though. Here are some pics from earlier in the day when Hannah was still involved. 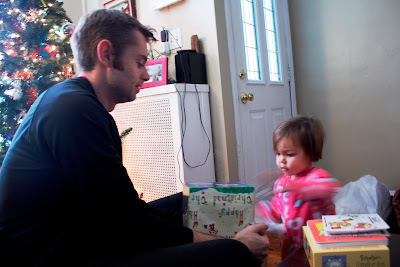 After opening presents and eating lunch, Hannah took a nap and us grown-ups played a chaotic and disorderly game of Crainum in which Eric and Justin attempted to improvise the rules much to everyone else's confusion and slight frustration. When Hannah woke up we had an early Christmas dinner and then headed down to see the lights on 34th Street. Trying to do that on Christmas Eve was a bad idea because there's too much last minute shopping and wrapping that needs to be done and family members were still settling in from their travels. 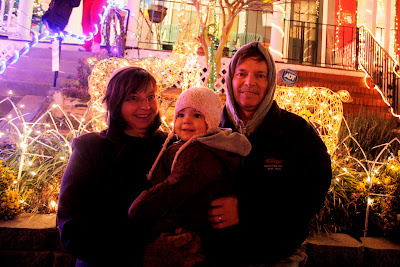 Walking down on Christmas, however, was perfect because after being cooped up indoors all day, we were itching for a little walk and some fresh air, and since nothing is open, the lights were a perfect option. We left the stroller at home and let Hannah get a little exercise too. The next pic is taken from the porch of the main house, the one that started the tradition and puts on the biggest production. 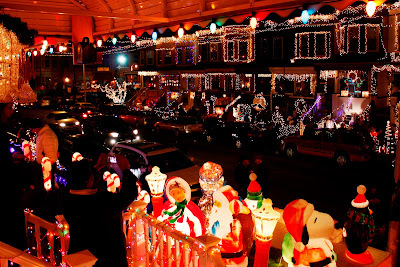 Can you believe this tradition is in its 62nd year?? That's a loooooong time! I took advantage of the opportunity for photo ops then and got everybody to pose in front of houses of their choice. Hannah with her Grannah and Granpah in front of the white reindeer. 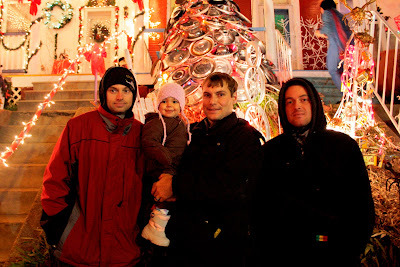 Hannah with Daddy, Uncle Justin (left), and Uncle Joel (right) in front of the hub cap Christmas tree. Us! 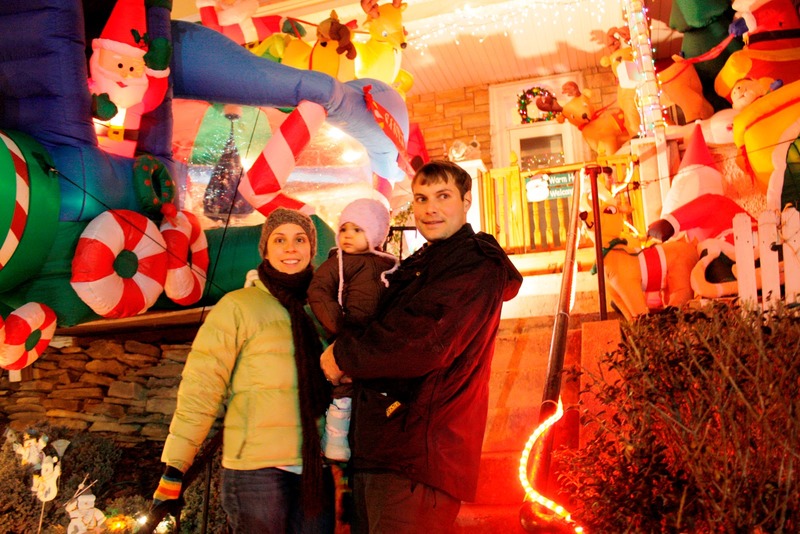 Me, my favorite munchkin, and #1 hubby in front of a bunch of crazy blow ups. 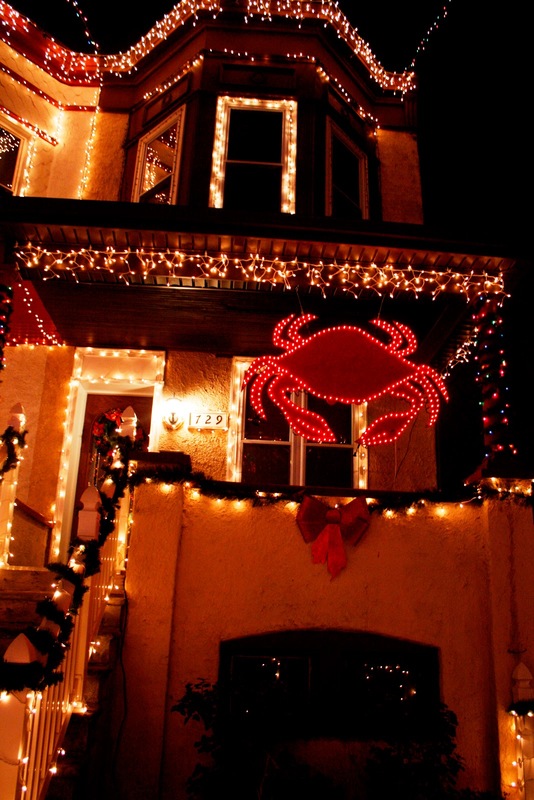 Even the Christmas decorations are Baltimore-centric. Gotta love that Be-more pride! I wish you all peace, love, and joy now and throughout the year and hope that those of you celebrating Christmas had a fun one and those of you not celebrating had a fun Saturday! love the shout out!! why is she soo cute, love the one of her with her mouth oen and then her hands in her snowsuit!!! gosh i love her. my parents were SMITTEN!!!!!! 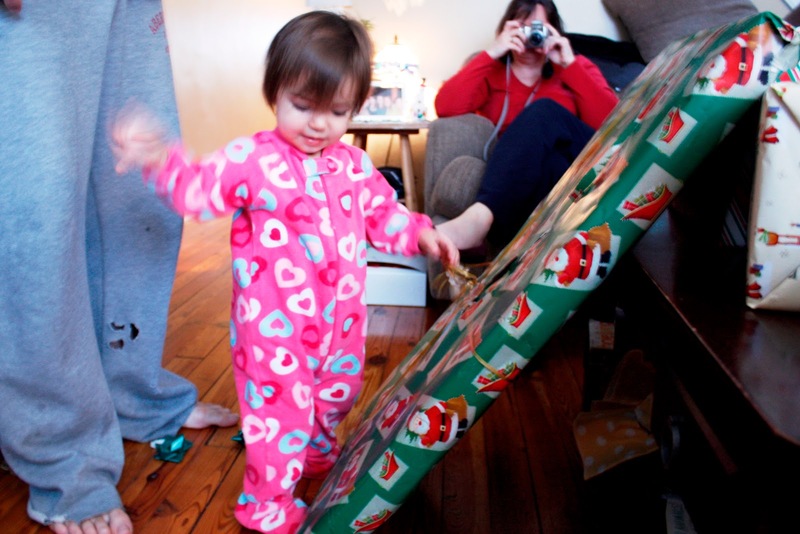 her xmas morning onsie is adorable too. like hello hot pink, hearts and feet!?!?! totally up my alley. i've been dying for one as a throw back to my youth, i even want the ruffles on the bum!!! haha no so sure if it would be socially acceptable but i'm ok with it. Glad everyone had a great day! 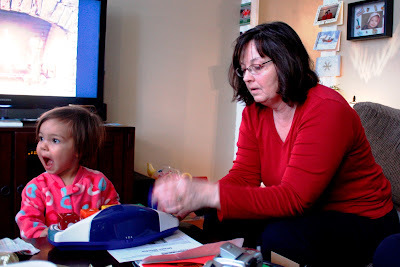 Great job on the blog post Terri! It has been great fun here in Baltimore. Precious memories.